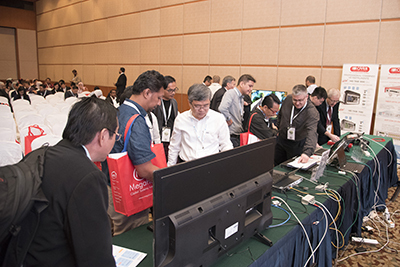 Participants from around the world attended the pre-conference workshops conducted as part of ABU’s Digital Broadcasting Symposium at Royale Chulan Hotel in Kuala Lumpur, today. Workshops on industry-relevant topics such as DVB-S2 satellite broadcasting, DAB+ technology enhancements, hybrid radio, spectrum efficiencies and new opportunities for new content on DAB+ informed and engaged participants. The workshops presented an opportunity for industry-networking, hands on learning and the sharing of latest developments in DAB+ for members. Demo sessions on technological innovations in DAB+ highlighted and informed participants giving them the very latest in technological advancements in DAB+. Dr Peter Siebert, Executive Director, DVB Project provided the introduction and preliminary workshop session on digital satellite television broadcast technology. Joan Warner, Vice President, WorldDAB Asia Pacific and CEO, Commercial Radio Australia provided the opening remarks and an update to the EBU Recommendation 138 on the use of digital radio standards. She also presented the progress on the digital switch over in Europe. She expanded upon the progress of DAB+ in the Arab States and the Asia Pacific regions and rounded her presentation off with the latest WorldDAB technical developments. Ben Poor of the EBU, joined a workshop remotely from Europe which was given by Nick Piggott and Kath Brown, RadioDNS on hybrid radio, and why ASEAN will drive innovation and scale-up. This was followed by a series of DAB+ business case studies, highlighting what broadcasters and manufacturers are doing to offer the best of IP and broadcast, why hybrid radio is essential for access, discovery and interaction and the relevance of DAB+ hybrid in national emergencies. 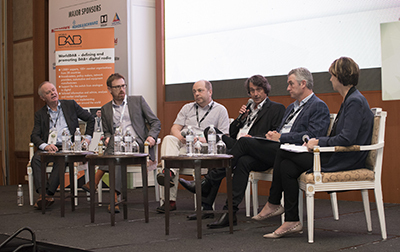 The CONFAB - a panel discussion of issues relevant to Asia Pacific broadcasters followed and proved to be a highly informative session much for the benefit of those participating. A question and answer break out session followed, giving a chance for discussions which identified the common challenges in planning for digital radio migration. All in all, it was an informative and enjoyable workshop series and a fitting start to ABU’s Digital Broadcasting Symposium. For a look at some of the workshop pictures please click here.